To back up your iPhone, connect your phone to your Mac or PC using the USB cable provided and open iTunes. After backing up your phone, you will then be able to use Decipher Tools software to save your text messages, voicemails, and other iOS data from your iPhone to your computer. You can make a backup of your iOS device on any computer using iTunes. If you use iTunes' syncing features, the computer does not need to be the computer that you sync with. In iTunes 12, when your iOS device is plugged into your computer, you should see a device icon in the upper-left section of the iTunes window. Clicking on that device icon will bring you to the summary page for that iOS device (iPhone, iPad, or iPod Touch) or bring up a menu of multiple devices for you to select from. In older iTunes prior to iTunes 12: In the upper-right corner of the iTunes window, you should see a button for one or more iOS devices. Press that button to bring up the summary page for your iPhone/iPad. If you do not see the button for your phone in the upper-right corner of iTunes, check to see if you have a list on the left-hand side of your iTunes window. If so, your phone should appear under "Devices" in that list. Click on the device name in order to bring up the information window for your iPhone/iPad. Note: If you do not see any of the buttons we reference above, you can also try "Devices" in the File menu. If you still do not see any devices in that File > Devices menu, it is likely that iTunes is having trouble recognizing your device — in that case, you can try restarting your computer, or contact us directly and we will help. In the "Backups" section of the summary page, press the "Backup Up Now" button. This will backup to your computer regardless of your iCloud settings on the left. Our Decipher Tools software can read from both non-encrypted and encrypted backups (assuming you know the password!) so you can leave the encryption checkbox set however you like. 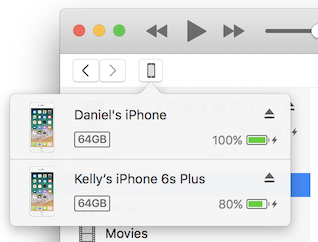 Note: Since iTunes 11, many people are seeing a screen that gives the option "Restore from Backup" or "Setup as New" when plugging in their iPhone for the first time to iTunes. You want to choose the option "Setup as New." Even though this sounds like it might wipe the phone, it does not -- it just sets up the phone as a "new" device in the list of devices that iTunes tracks. We believe that this happens only the first time you plug in your iPhone after upgrading to iTunes 11.